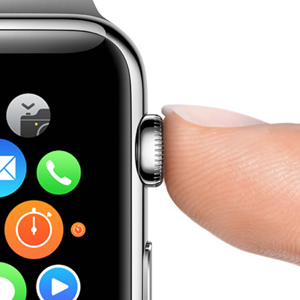 First, the screen size: It’s mostly dictated by the size of the human wrist, and cultural customs around watch sizes. I think Apple’s two choices of watch size balance the needs of screen size vs. wrist size, for large and small wrists. The limiting factor here is the human body, not technology. The digital crown. I think the digital crown has to be as big as it is to be ergonomic as you spin it with your fingers. Traditional watches have smaller crowns, but they’re not meant to be used several times a day, so they can get away with being smaller. Not this one, though. And for the crown to be a big as it is, the watch needs to be as thick as it is. I don’t think this is going to change. And if it doesn’t change Apple has the chance at an unprecedentedly profitable replacement cycle: Customers buying a super expensive, high margin product one year, and then replacing the guts (perhaps at an even higher margin) every year. By making the product upgradable, Apple could be unleashing a bigger business than anybody realizes.